Explorations in Quilting and Life: Busy November! My art quilts will be quite busy in early November. Ice Flow is out in Spokane, WA where it is currently hanging in a gallery at the Northwest Museum for Arts and Culture. 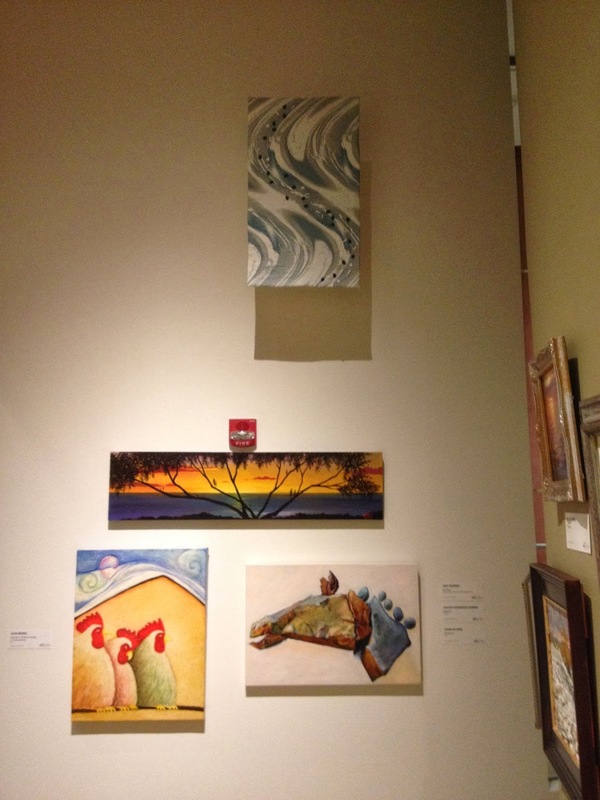 It has been juried into a silent auction that will take place on November 9. I was able to see Ice Flow on exhibit. You can see it in this photo - it is the top work. 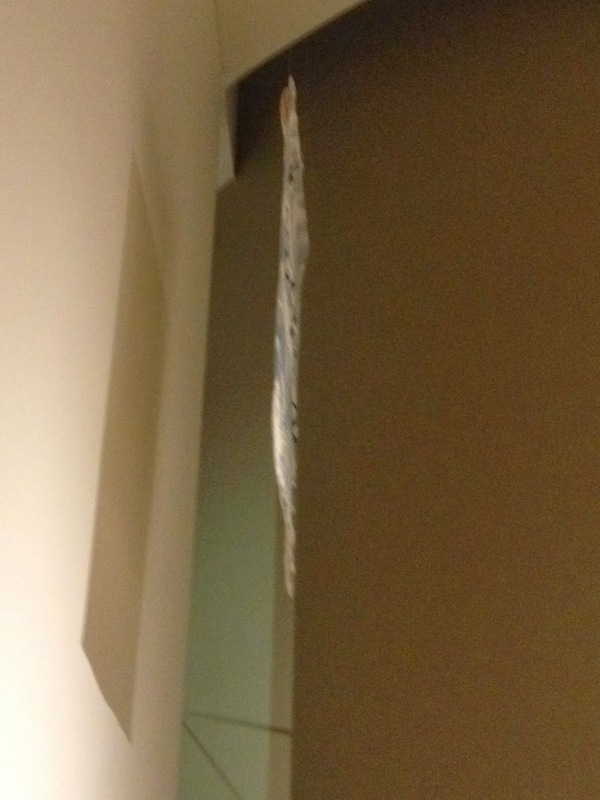 It was hung from the ceiling of the gallery, about 6 or so inches from the wall. Here is a photo of it from the side - I thought it was a very effective way to hang it - I had sent a slat that fit in the sleeve and had eye hooks on the ends. Thin transparent cord was used to suspect it. Other art quilts traveling in November include Spirit which I had previously posted about and continues its stint at the Tubac Center for the Arts until November 19. Two other pieces, Journey and View From On High, open on November 9 at the Main Street Arts gallery in Clifton Springs, NY in the exhibit "Fabulous Fibers". And, finally, Zen Moment, has been in Houston this week as part of the annual SAQA Benefit auction. Congratulations on your shows! 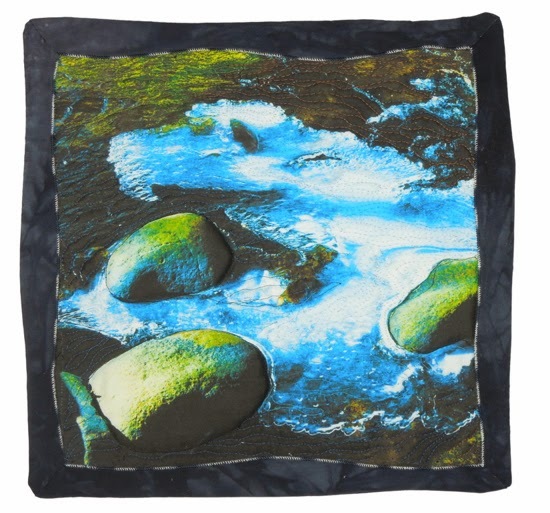 "Ice Flow" is so lovely; I'm sure it will sell. Isn't it a pity that galleries don't know how to cope with hanging work near a fire alarm?! Something similar happened to my daughter's piece in the Lacombe 10 x 10 exhibit -- like the wee red distraction above the piece below yours! And having a piece at Houston?! Superb! :-) May it sell well too!